Borderlinx | Buy Carter's and ship worldwide with Borderlinx. Cheap rates guaranteed. Let your little ones shine as bright as their personalities with fun, inspired, and affordable apparel and accessories from Carter's USA. Carter's USA has become a trusted name in clothing, gifts, and accessories for their quality, unbeatable comfort, and thoughtful design, with you and your child's activities and behaviors in mind. For nearly 50 years, Carter's USA pieces have been as unique as your child, and with an incredible selection available for all ages of kids, toddlers, and babies, you're guaranteed to find the perfect fit, style, and personality. Carter's USA offers an incredible selection of clothing, shoes, gifts, and accessories for babies, toddlers, and kids, all with the help of unbeatable customer service. No matter the time of year, Carter's USA products can bring a smile to your child's face and a sense of comfort and confidence to your heart. Operating with your family and its budget in mind, many pieces are available for even as low as under $20, so that you can focus on what's important for your children. A family company, Carter's USA is strongly committed to social responsibility when it comes to manufacturing, industry relations, and beyond. 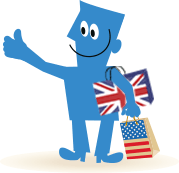 Now, customers internationally can buy Carter's in the USA with Borderlinx! Borderlinx will ship your order to your home country with cheap shipping, tax & duties determined upfront by our shipping cost calculator. A number of services such as concierge, free repacking and consolidation services are additionally available through Borderlinx to make international ordering from Carter's USA hassle-free!